Internet connection, then click the "Sync" button. - Your monthly upload allowance has been raised to 500MB. - You can now add any file type to your notes. treatment by our recognition servers. - You will now receive premium support. your username. We will get back to you within 24 business hours. 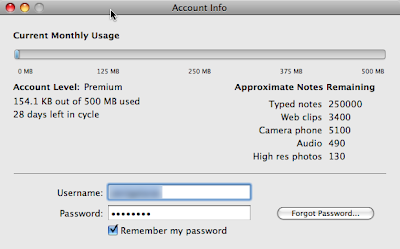 Settings page on Evernote Web. Get the latest Evernote updates by reading our blog and following Evernote on Twitter.